Well, campaign finance figures are out, and OC Political will be doing our signature in-depth slicing and dicing of campaign finance numbers in the coming days. Last week, we had several candidates send over press releases touting their fundraising prowess. Some even asked us explicitly to post their releases. We opted not to post any of those until we could examine the numbers ourselves. Indeed, six months ago, I admonished readers to check the numbers against the press release claims in a post on AD-55. Some candidates are spinning wildly, but there are other times when candidates’ numbers actually gel well with their press releases. The only way to figure out which is the case is to look at the numbers. First up is the race for AD-74 to replace Allan Mansoor, who is leaving the Assembly to run for the 2nd District Supervisor’s seat, being vacated by the termed out John Moorlach. AD-74 consists of Costa Mesa, Laguna Beach, Laguna Woods, Newport Beach, the southern half of Huntington Beach, and portions of Irvine. There are four declared Republican candidates: Huntington Beach Mayor Matt Harper, Newport Beach Councilman Keith Curry, Assemblyman Travis Allen’s District Director Emanuel Patrascu, and H&R Block Franchise Associate Karina Onofre. Huntington Beach Mayor Matt Harper entered the race the third week of November. He reported a $4,100 max-out contribution from Karen Harper on December 7. Matt Harper loaned his own campaign $2,000 on Christmas Eve. 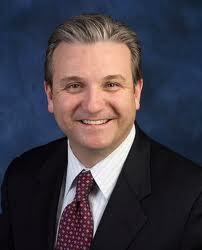 Newport Beach Councilman Keith Curry entered the race the first week of December. On December 6, he transferred 20 contributions totaling $6,490 from his City Council account to his Assembly account. During the rest of December, he raised $20,705 from 22 donors, plus another $495 from small unitemized donations. His donations included $4,100 max-out contributions from the Orange County Business Council‘s BIZPAC and the campaign committee of former Senator Tom Harman. He also reported $1,000 from Long Beach Councilman Gary DeLong (who was the unsuccessful Republican nominee in CD-47 in 2012 against Alan Lowenthal), $500 from former Newport Beach Mayor Tod Ridgeway, and $250 from Curry’s council colleague, Nancy Gardner. If Curry can continue his pace of $21,200 per month, he will quickly amass the largest warchest in AD-74. However, many candidates find their fundraising slows down after an initial burst after their campaigns launch when they pick up their low-hanging fruit donors; can Curry defy the odds? Emanuel Patrascu, who is Assemblyman Travis Allen‘s District Director and was formerly on the staff of Senator Tom Harman, announced his official November 18 kick-off in September but had been raising money prior to his kick-off. He reported $25,079 from 41 donors, plus another $1,266 from small unitemized donations. His donations included $4,100 max-out contributions from businessmen Kieu Hoang and Buddy Molway. He also reported $500 from Harman’s campaign committee in October and $2,000 in prior reporting periods, for a total of $2,500 from Tom Harman‘s committee. He also reported $1,000 from former California Republican Party Chairman Mike Schroeder, $250 from the former Assembly campaign committee of Rancho Santa Margarita Councilman Steve Baric (the CRP’s Immediate Past Vice Chair), and $150 from the campaign committee of Westminster Mayor Tri Ta. Patrascu loaned himself $5,000 on New Year’s Eve, $1,500 in June, and $18,700 in 2012. He raised $17,600 during the same period that Curry raised $21,200 (Patrascu raised $2,750 after his campaign kick-off but before Curry entered the race). If Patrascu can continue his pace of $17,600 per month, then he will be able to build a sizeable warchest. As I said with Curry, however, many candidates find their fundraising slows down after an initial burst after their campaigns launch when they pick up their low-hanging fruit donors; can Patrascu defy the odds? Businesswoman Karina Onofre, who previously ran unsuccessfully for Santa Ana City Council in 2012, entered the race Thanksgiving week. She did not file her campaign finance report electronically, as she did not reach the $25,000 threshold to require electronic filing. Notes: Figures may be off by one dollar due to rounding. Campaign finance reports for July 1-December 31, 2013 were due last week. By the way, OC Political probably won’t detail individual donors in most races; it’s just that AD-74 had so few donors, it was doable. In other races, the data is more voluminous. We surely got your attention and this morning’s headline will require no caffeine for OC politicos. Rancho Santa Margarita Councilman Steve Baric is taking himself out of the race for State Assembly in the 73rd Assembly District (South Orange County). Jon Fleischman of Flashreport explains Councilman Baric’s reasons why the sudden departure. My colleague Chris Nguyen on August 1st explained that Baric was the runner-up on the campaign war chest. The 73rd AD contest will surely shake things up in the coming days. In a surprise development, campaign finance reports show Rancho Santa Margarita Councilman Jesse Petrilla leads the pack in fundraising in the 73rd Assembly District race. The narrative in AD-73 had generally been that Rancho Santa Margarita Councilman Steve Baric, the immediate past Vice Chairman of the California Republican Party, would be the top fundraiser in AD-73 and that Petrilla would depend on a low-budget grassroots strategy. Indeed, throwing in former Laguna Niguel Councilman Paul Glaab’s fundraising figures, Petrilla raised more than Baric and Glaab combined. Petrilla raised the most money from donors, with $69,230 in contributions. Baric followed with $54,470. Capistrano Unified School District Trustee Anna Bryson was closely behind Baric with $53,052. Dana Point Councilman Bill Brough (former Chief of Staff to AD-73 incumbent Diane Harkey) was fourth with $30,899. Finally, Glaab raised $14,749. I’m only reporting numbers for the Republican candidates, as I have found no indication of a non-Republican running for AD-73 at this point. It’s still early of course, as the election is in June 2014, and the latest campaign finance reports were for the first half of 2013. However, these numbers are troubling for Brough and Glaab in that Bryson raised more than Brough and Glaab combined, Baric raised more than Brough and Glaab combined, and Petrilla raised more than Brough and Glaab combined. In the land of expenditures, Bryson spent more in the first half of 2013 than all of her opponents combined. She spent $10,570, and the rest of the field expended a combined $9,804. More than 80% of Bryson’s expenditures went toward consultants. Brough spent the second most, with $5,315, scattered across numerous small expenses. Petrilla was third in spending with $3,622, also scattered across numerous small expenses. A distant fourth in expenditures, Glaab spent $470, which was a single expenditure for appetizers for his June 6 fundraiser. Spending the least was Baric, who expended $397, with $322 (81%) going to credit card processing fees for his donations and the remaining $75 in tiny, unitemized expenses. According to the Form 460 campaign finance reports, Glaab loaned himself the $100,000 on June 30, the final day of the reporting period, while the law firm of Baric & Tran loaned Baric’s campaign $100,000 also on June 30, though oddly scattered across three loans, one of which was only $48. Bryson loaned herself $14,600 across four loans made over several months, with a $100 loan in January and loans of $4,750-$5,000, made on a monthly basis in April, May, and June. Brough lent himself $100, one of the rare loans where I think the candidate will actually spend the money, as I just don’t think the average candidate cares about getting repaid $100. As their $100 loans were made before receiving any contributions, I suspect the Bryson and Brough $100 loans were simply to meet the minimum deposit requirements to open their bank accounts. I give Brough credit for taking advantage of the $50 new bank account bonus promotion at Wells Fargo. I do not recall an instance of a campaign finance report where the candidate used one of these offers. Although it’s only $50, I always applaud candidates who find creative (yet both legal and ethical) ways to find money for their campaigns. Campaign finance reports for January 1-June 30, 2013 were due at 11:59 PM last night. It’s still early in the campaign finance figures, and the July 1-December 31, 2013 numbers will be more telling, but it’s still surprising that Petrilla outraised Baric by 27% and that he leads the rest of the field in fundraising, as the usual AD-73 narrative was that Petrilla would struggle to raise money, relying on an aggressive ground game for his campaign rather than any significant spending. As I noted above, Brough and Glaab’s early numbers don’t look promising, as the two of them combined raised less than Bryson, who herself raised less than either Baric or Petrilla. $100,000 is the magical amount sprinkled in loans across campaigns for Assembly representing portions of Orange County. In AD-73, former Laguna Niguel Councilman Paul Glaab loaned his own Assembly campaign $100,000 on June 30, according to his Form 497. Also in AD-73, the law firm of Baric & Tran loaned Rancho Santa Margarita Councilman Steve Baric‘s Assembly campaign $100,000 on July 10, according to his Form 497. As they are not yet due, the Form 460s (the complete campaign finance reports for each reporting period) have not been filed by any campaigns for AD-55 or AD-73 for the January 1-June 30 reporting periods. Due to the $100,000 loans, the Chang, Glaab, and Baric campaigns had to submit their Form 497s, as those must be filed within 10 business days of receipt of more than $5,000 from any one source (in the final 90 days before an election, Form 497s must be filed within 24 hours of receipt of more than $1,000 from any one source). Chang and Glaab both loaned their campaigns the $100,000 on June 30. The significance of that date is that June 30 is the final date of the reporting period for the first half of 2013. The next reporting period doesn’t close until December 31. Due to their loans, Chang and Glaab will be able to show an additional $100,000 on their Form 460 reports and then spend the latter half of 2013 raising money before the next reports are due. The $100,000 loan from Baric & Tran on July 10 is a puzzling case, as it is not a personal loan and it was made very early in the reporting period and won’t appear on Baric’s Form 460 until after December 31. What is the magic of the specific $100,000 figure? It’s the most a candidate can loan their own campaign and still get repaid. Any amount loaned to the campaign that exceeds a $100,000 balance is considered a contribution to the campaign, rather than a loan, so it cannot be repaid to the candidate. Specifically, Government Code Section 85307(b) prohibits candidates for state office (i.e. the Legislature, the Board of Equalization, and all statewide offices other than U.S. Senator) from having an outstanding balance of more than $100,000 in personal loans to their own campaigns. The candidate is the only person (or entity) who can loan a campaign more than the contribution limit. Any other person or entity is subject to the campaign contribution limit of $4,100 per election for a state legislative race (this limit is in place through the end of the 2014 General Election). Rancho Santa Margarita, CA – – Republican candidate for State Assembly, Steve Baric, announced the endorsement of the Orange County Business Council (OCBC) today in his campaign for the 73rd District. The OCBC works to enhance Orange County’s economic development and prosperity. The organization serves as the leading voice on every issue that relates to the betterment of Orange County’s Businesses and community development. 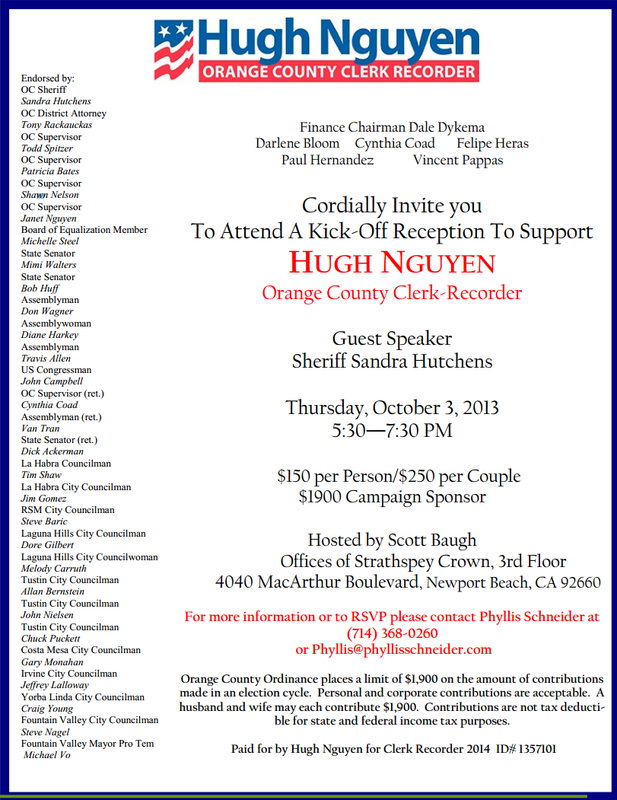 The OCBC adds its name to Baric’s growing list of supporters which already includes notable endorsements such as Orange County Sheriff Sandra Hutchens and Orange County District Attorney Tony Rackauckas. The 73rd District includes the Orange County cities of Aliso Viejo, Dana Point, Laguna Hills, Laguna Niguel, Mission Viejo, Rancho Santa Margarita, San Clemente and San Juan Capistrano as well as the unincorporated areas of Ladera Ranch, Ortega, Silverado and Trabuco. Almost 49 percent of the district’s voters are registered Republicans, and 25 percent are registered Democrats. Steve Baric, his wife, Melissa and son Matthew, live in Rancho Santa Margarita. The rest of the nation commemorated Martin Luther King, Jr. Day today, and Barack Obama was sworn in to a second term as the 44th President of the United States. Here in Orange County, however, the Republican Central Committee is gathering to swear in its 2013-2014 membership, elect its 2013-2014 officers, and hear from Jim Brulte. Captain Emily Sanford delivered the invocation and new Central Committee member Peggy Huang led the Pledge of Allegiance. Central Committee Chairman Scott Baugh called the roll. State Senate Republican Leader Bob Huff swore in the Central Committee members. Huff joked that it was nice to be in a place where there’s actually multitudes of elected Republicans. Lucille Kring, Henry Charoen, Robert Hammond, Tony Beall, Mike Munzing, Scott Voigts, Cecilia Iglesias, Anna Bryson, Tom Tait, Jesse Petrilla, Travis Allen, Don Wagner, Greg Sebourn, Bill Brough, Tim Shaw, Fred Whitaker, Todd Spitzer, Jeff Lalloway, Deborah Pauly, Steve Nagel, Mark McCurdy, Matt Harper, Steven Choi, Allan Mansoor, Dean Grose, Mark Schwing, and Craig Young were the elected officials introduced. Long Pham announced he is running for the 34th Senate District in 2014. Anna Bryson confirmed she has filed paperwork to run for the 73rd Assembly District in 2014. Baron Night announced he was running for Buena Park City Council in 2014. At 7:32 PM, John Warner nominated Scott Baugh for re-election as Chairman. At 7:33 PM, Mary Young nominated and Tim Whitacre seconded John Warner for re-election as First Vice Chair. At 7:34 PM, Bill Brough nominated Mary Young for re-election as Second Vice Chair. At 7:35 PM, Mary Young nominated and John Warner seconded Peggy Huang for Secretary. At 7:35 PM, Kermit Marsh nominated and Robert Hammond seconded Mark Bucher for re-election as Treasurer. At 7:36 PM, Mike Munzing withdrew his candidacy for Assistant Treasurer and nominated TJ Fuentes, with a second from Jon Fleischman. At 7:36 PM, Pat Shuff nominated and Lucille Kring seconded Norm Dickinson as Sergeant-at-Arms. At 7:37 PM, the entire slate of executive committee officers was elected unanimously. Chairman Scott Baugh reappointed Kermit Marsh as Parliamentarian. At 7:38 PM, Orange County Central Committee Chairman Scott Baugh introduced former Senator Jim Brulte, who is running unopposed for California Republican Party Chairman. Brulte said he was elected to the San Bernardino County Republican Central Committee at the age of 18. After working in DC, Brulte returned to San Bernardino County as Executive Director of the Central Committee. Brulte had painted the Republican Party headquarters in San Bernardino at the age of 10. 1. The CRP is hundreds of thousands of dollars in debt. He wants to rebuild a statewide donor base of small donors, medium donors, and large donors. The CRP only has three employees currently. 2. The CRP must rebuild and expand the grassroots to protect David Valadao and Gary Miller; capture the seats formerly held by Brian Bilbray, Mary Bono Mack, and Dan Lungren; capture the seat held by Lou Correa; and protect the seats held by Eric Linder, Jeff Gorell, and Mike Morrell. Deborah Pauly asked Brulte about the Tea Party. Brulte said anyone who supports Republican principles of limited government would be welcome and are the core of the grassroots. Marcia Gilchrist asked about CRP headquarters. Brulte said the CRP headquarters are in a state of disrepair and need rehabilitation. Teresa Hernandez asked about Hispanic and Latino outreach and about immigration policy. Brulte said the CRP must reach out to people of every community, Latinos, African-Americans, and every community out there. Brulte said it is not the CRP Chair’s job to pontificate on policy issues, it is the CRP Chair’s job to raise money. He said it is Congress’s responsibility to legislate on immigration. Brulte says he wants to focus on the nuts and bolts; he will be appearing on television, on radio, and in newspapers, far less often than previous CRP chairs, so he can focus on nuts and bolts. Dean Grose asked about reinvigorating the CRP. Brulte said he gained seats during his tenures as Republican Leader in each house of the Legislature. He said the CRP is severely behind technologically. Mike Withrow urged people to donate more money. Despite his blue collar profession, Withrow has been able to donate $1000 each year for years. Outgoing CRP Vice Chair Steve Baric spoke of Brulte’s accomplishments in the Legislature and urged support for Brulte for CRP Chair. At 7:57 PM, Jon Fleischman moved and Mary Young seconded for the OC GOP to endorse Jim Brulte for CRP Chair. The motion passed by acclimation. Baugh then outlined the top lessons of 2012. 1. GOTV and grassroots matter. He cited numerous instances of close races and noted that a shift in just 500,000 votes in four states out of well over 100,000,000 votes in fifty states could have made Mitt Romney president. 2. Messengers matter. Baugh noted Orange County’s population is like few other metropolitan areas, with 34% Latino and 18.5% Asian. Republicans has lost 7% registration in the last decade, so Baugh says the GOP must work to fight this trend by better engaging Latinos and Asians. 3. Message and tone matter. Baugh said thoughts and ideas are more important than feelings, but properly framing thoughts and ideas are key. Baugh called the Republican Party the party of hope, opportunity, and prosperity for all. Baugh expressed disapproval of Romney’s 47% remark. Baugh pointed to Ted Cruz’s language of opportunity conservatism. He said the term of “limited government” is meaningless to the unemployed or the parents with children in poor schools but “removing barriers and regulations impeding job creation” and “giving parents choices” are the language of opportunity conservatism. He said conservative ideas must be described in how they can help advance opportunity. Baugh said immigration policies are out of date, unenforced, or unenforceable. He said there is a labor supply in Mexico and a labor demand in the US, and people in Mexico are seeking a better life. He said America allows people to seek a better life and asked “who among us” would not come to America from Mexico to seek a better life. Baugh said neither amnesty nor deportation is the answer; it lies somewhere in the middle of those two extremes, a solution that respects dignity and the human spirit. He said Republican policies must offer opportunity to all. After a brief recess, the 65th District named Alexandria Coronado as its Executive Committee representative, and the 69th named Charles Hart as its Executive Committee representative. These seven people comprise the entire Financial Review Committee. Chairman Scott Baugh presented the Local Elected Official of the Year Award to Irvine Mayor Pro Tem Jeff Lalloway for his successful efforts at building a team that toppled the Larry Agran machine in Irvine. Baugh spoke of sending the party’s financial and grassroots resources to Irvine. Lalloway thanked Mayor Steven Choi, Councilwoman Christina Shea, and Council candidate Lynn Schott. Lalloway spoke of losses at the federal and state levels but the hope that Irvine Council provided, with the police union endorsing Agran’s entire slate and with $1,200,000 spent by Agran’s side including $300,000 spent by Agran personally. Chairman Scott Baugh presented the Legislator of the Year Award to both Congressman John Campbell and Assemblyman Don Wagner for their efforts in bankrolling much of the OCGOP’s efforts in Irvine. Wagner thanked Lalloway, Choi, Shea, Baugh, the Central Committee, and all the volunteers who helped in Irvine. On Campbell’s behalf, Lou Penrose spoke of Campbell’s great delight at the Irvine results and the importance of team efforts. Noting his own Italian heritage, Penrose spoke of doing this as a family effort. Chairman Scott Baugh announced that Assemblyman Don Wagner was renting a currently-vacant portion of the OC GOP Headquarters in Tustin for his campaign office. Rhonda Rohrabacher and Assemblyman Don Wagner presented the Anna Woods Memorial HQ Volunteer of the Year Award to Naz Namazi for her efforts at the OCGOP HQ and in Huntington Beach. Namazi also received awards from the offices of Senator Mimi Walters and Supervisor Pat Bates. Captain Emily Sanford, Zonya Townsend, and Assemblyman Don Wagner presented the Captain Emily F. Sanford, USN (Ret.) Volunteer of the Year Award to Chalone and Harold Warman of San Clemente. The Warmans called themselves “rare Republican teachers,” as Chalone Warman was a teacher at San Clemente High School and Harold Warman taught at San Diego State University. Irvine Mayor Steven Choi spoke to the Central Committee. He quipped, “It took a village to elect a Republican Mayor of Irvine.” Choi thanked Irvine Mayor Pro Tem Jeff Lalloway, Irvine Councilwoman Christina Shea, Congressman John Campbell, Assemblyman Don Wagner, former Supervisor Bill Campbell, and the volunteers who made his victory possible. Choi also reported Republicans now have a registration advantage over Democrats among Orange County’s Korean-Americans. At 9:08 PM, the Central Committee adjourned.